Farinheira (Portuguese pronunciation: [fɐɾiˈɲejɾɐ]) is a Portuguese smoked sausage made mainly from wheat flour, pork fat and seasonings (white wine, paprika, salt and pepper). It has a yellow/brown colour and is served in traditional dishes like feijoada or cozido à portuguesa. It is also eaten on its own, roasted or fried. In modern versions, it is previously cooked, then peeled and mixed with scrambled eggs and served on bread or toast as a starter. 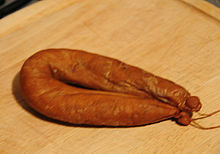 Although it resembles a chouriço or other meat sausage, its taste is not meaty; it is tangy (but not hot), with a doughy texture and has a somewhat sweet finish in the palate. 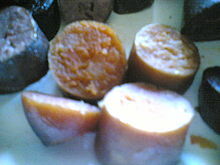 It is never cooked sliced unlike other sausages since its dough-like content would pour out of the skin during cooking. Farinheira de Estremoz e Borba, from Estremoz and Borba area, PGI since 2004. Farinheira de Portalegre, from Portalegre area, (PGI) since 1997. ^ Farinheira de Estremoz e Borba in the DOOR database of the European Union. Retrieved 2014-03-16. ^ Farinheira de Portalegre in the DOOR database of the European Union. Retrieved 2014-03-16. Wikimedia Commons has media related to Farinheira. This page was last edited on 18 November 2018, at 01:26 (UTC).